This episode felt like everything is finally starting to gel in terms of production. I don't recall any bad music choices and maybe with the exception of the initial attack on Moya, no weird directing decisions (the weird slo-mo from the last episode). We got more explorations of our characters with Zhaan being a downright combination of peaceful monk and frighteningly adept warrior. Kudos points for when she uses her own blood (white!) to stir into the ingredients of her concoction. We learn a little more on D'argo, including the concept of pain/physical trauma being necessary to rid his body of his blood's own poisoning (which then sets the backdrop later for the incredible "When the Blood Runs Clear," episode down the line). For the most part, I think Zhaan and the captive was probably the most fascinating storyline. Rygel gets points for dealing with an obvious better in terms of galactic royalty, and the pitiful moment when he decides he should start eating his food off the mud. More bonding between Aeryn and D'argo. Dangling story element - we never again see or hear about the massive consortium, which you would think would have played some role later on given the galaxy spanning storylines that arise on the back half of the show. Surprising moment of the episode goes to Aeryn not realizing that D'argo's sword was also a rifle. It's a weapon symbolic to his race and one would think everyone, at least in a military profession, would know of it. To this day, whenever someone, including myself, can't get a word right I end up muttering "Tav-*leks*" like Aeryn does in command after she knocks John out. The other thing I love about this is at the end when Crichton is actually holding Rygel, he feels much more like a person that way, rather than just a puppet. Yeah, I can only put that down to ingrained Sebacean arrogance towards other lesser races, Aeryn being more pilot than ground troops and maybe the Qualta blade is a bit of an antique artefact? Not sure. It's not one of my very favourite episodes, but it has good Zhaan bits - I liked the 'No sermons' line at the end, felt a bit like a declaration of the show's stance on Trek-like moralizing at the end of an episode, and on a completely shallow note, Aeryn's leather waistcoat. Yes, the leather is starting to creep in. Oh, I also liked Rygel's eyebrows in this episode. And the 'unconscious' joke. This. And also 'Crichton!!!' in moments of extreme frustration. 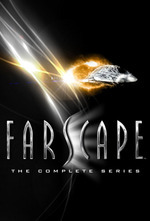 Looking more generally, I suppose it's quite traditional storytelling the way that John fights desperately to hold on to his sense of self where as Aeryn has to grow into something ultimately very different (the foundations of both paths being established in the pilot and followed through on pretty much all the way through the show) but it really works in Farscape, I think. It's one of the main engines driving everything. I'm just discovering this rewatch, so please forgive the late addition and semi-necromancy, but this is something Ben Browder calls out explicitly about this episode in specific and the show in general during the first season commentary. To paraphrase from memory, "to get 'actory' for a second, being able to get your hands on the puppet makes the character real and gives you something to play off of". I see there's already been some discussion about the physicality of the show, and the practical effects interactions are a huge part of making the universe feel consequential and lived-in.